The research and innovation hub Cooperative Automotive Research Network (CARNET) -driven by the UPC, Volkswagen Group Research and SEAT- and focused on the automotive and urban mobility of the future, has been recognized with the National Prize for Public-Private Partnership in Research and Innovation 2017, awarded by the Fundació Catalana per a la Recerca i la Innovació, with the support of the Government of Catalonia. CARNET is the first platform of knowledge and collaboration between the industry and the university that takes Barcelona as a testing ground to test new technological solutions that improve the quality of life of citizens in the field of mobility. It is open to the participation of institutions and companies that want to respond to the challenges of urban mobility. The initiative, coordinated by the Center for Innovation and Technology of the Polytechnic University of Catalonia (CIT UPC), has the support of other business partners, such as Altran, Applus + Idiada, the Cluster of the Automotive Industry of Catalonia (CIAC) , Kineo, Ficosa, PTV Group, RACC, and Rucker Lypsa. Virtual Mobility Lab: a simulation tool, developed by the inLab of the School of Informatics of Barcelona (FIB) of the UPC, with the collaboration of Volkswagen Group Research, SEAT, PTV Group and Kineo, which analyzes and evaluates the impact of smart mobility projects in Barcelona and that allows extrapolating results before implementing any pilot test. In one of the first tests, the Virtual Mobility Lab has verified that, with the use of 500 on demand shuttles, it will be possible to reduce up to 2,000 private vehicles of the streets of the city, with the consequent improvement in the traffic and the levels of pollution presented at the Smart City Expo World Congress 2017 in Barcelona, this is a strategic project for CARNET partners, given the growing need for new simulation tools to implement new mobility solutions for citizens. 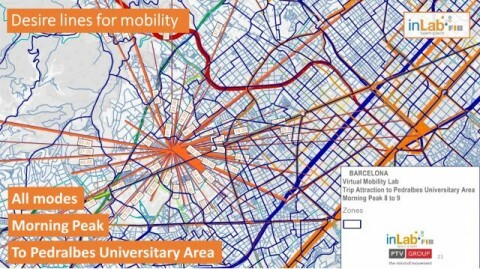 Within the same project, the inLab FIB UPC has carried out the first detailed multimodal modeling of the first crown of the Metropolitan Area of Barcelona that integrates both the offer of all public transport modes, such as the private vehicle and the updated mobility demand. The new modeling will support decision-makers in mobility policies, as well as transport operators or new companies that develop new mobility alternatives and want to evaluate them. On demand Shuttle Service: CARNET, together with SEAT, RACC and the company Shotl, have proposed a new transport system, based on shared vehicles on demand, which has been pilot tested with UPC students and RACC workers in the Eixample of Barcelona. It is a more sustainable, efficient and flexible urban mobility model, in which the inLab FIB of the UPC has contributed simulation and optimization techniques. The start-up Shotl has developed the IOS and Android technologies of the system, as well as the algorithm that plans the management of the routes. On the other hand, CARNET has also organized the Automonous Driving Challenge, a challenge aimed at engineering students in which participants had to develop software capable of moving a vehicle autonomously through a limited circuit. In the same line of promoting the creation of talent, CARNET directs the Hackaton Mobility Barcelona every year, to promote the design and construction of projects that improve urban mobility. Likewise, the 'hub' participates in international networks and competitive calls, creating a high quality mobility research environment. In this regard, it organized, last November at the UPC, the third edition of the Symposium on Challenges of Urban Mobility, Mobility as a Service (Maas) with experts from all over Europe.. The National Research Awards 2017, which have been made public on December 27 and will be delivered at an event in Barcelona in March 2018, aim to promote the social recognition of science and, in particular, disseminate among Catalan society the scientific activity of researchers and entities linked to Catalonia. News from UPC press room.